Obituary – Dexter, Bobby Joe « Perry High School Alumni Association, Inc. Band ’42-’46, Boys’ Glee Club ’44-’45. Funeral will be at 11 a.m. Wednesday at Parker Funeral home for Bobby Joe Dexter, 49, route two, Perry, who died unexpectedly at 6:15 p.m. Sunday at Perry Memorial hospital. Dexter was taken to the hospital by Perry fire department ambulance after being stricken ill at his home, three miles west, two miles south and one-half mile east of Perry. He was admitted at Perry Memorial at 3:05 p.m. Sunday. Rev. W. B. Livingston, pastor of the Church of the Nazarene at Claremore, will officiate. Burial will be at Grace Hill cemetery. Dexter was born Dec. 1, 1927, in Perry. He was a 1946 graduate of Perry high school and served with the United States Marine Corps from 1946-1950 and with the United States Navy from 1950-56. He and the former Helen Phillips of Missoula, Mont., were married Sept. 21, 1957. 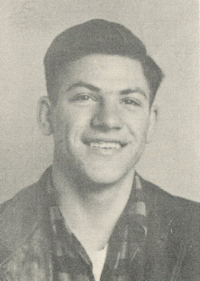 Dexter lived in Montana and Idaho from 1957-72, when he moved back to Perry, where he was engaged in an electrical business. He was a member of the Calvary Baptist church, the Independent Order of Odd Fellows, Eagles Lodge and the Lions club. Survivors include his wife, Helen, of the home address; a son, Michael, and two daughters, Michelle and Marla, all of the home; his mother, Mrs. Venice Dexter, Perry; and a brother, Dan Dexter, Perry.